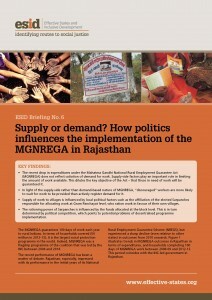 The recent performance of MGNREGA has been a matter of debate. Rajasthan, especially, performed impressively in the initial years of its National Rural Employment Guarantee Scheme (NREGS), but experienced a sharp decline (even relative to other states) in outcomesfrom 2010 onwards. Researchers sought to establish whether the fall in MGNREGA expenditures reflects falling demand for work, or a failure of the state to supply work. Researchers conducted a large primary data survey in 75 multi-village Gram Panchayats, 328 villages and 3,916 households across eight districts in Rajasthan. Their findings showed that supply-side factors play an important role in limiting the amount of work available. Supply of work to villages is influenced by local political factors, such as the affiliation of the elected Sarpanches responsible for allocating work at Gram Panchayat level, who ration work in favour of their own villages. The rationing power of Sarpanches is influenced by the funds allocated at the block level. This in turn is determined by political competition, which points to potential problems of decentralised programme implementation. In providing a political explanation for fund allocation, the research seeks to understand better why the scheme varies across different parts of India, and to unearth the impact of MGNREGA on employment and poverty rates.